You must make reservations at least 5 minutes in advance of the time at Spiro's - Chesterfield. Dine in with Spiro’s and enjoy an unforgettable dining experience unique and unparalleled to any other restaurant in the Saint Louis area. Whether you are trying our classic and remastered Mediterranean dishes or our American fare seafood, steaks and pastas, your experience will be memorable and will leave you wanting to share your experience with your friends and family. Excellent as always. The only drawback is the high noise level. My wife and I were celebrating our anniversary and we wanted to go to someplace special. It was our first time here and we couldn't have been more pleased. Our food was exceptionally great and our waiter, Vito,made everything really nice. Very good service. Quiet so you can actually hear each other talk. Good food. Want to but, new management has made changes not in keeping with my expectations of one of my favorite places to have dinner. So, can't recommend at this time. Very accommodating of lactose intolerance. Happy hour menu is always a great option! Always love dining at Spiro's. The food & service are always excellent. I would highly recommend it! Fantastic as always. Take advantage of their early bird special. Good as usual, we come here often and are seldom disappointed. Spiro's is always an excellent choice - great food, great service at a reasonable price. It is always at the top of my list when I wish to celebrate a job promotion, birthday, anniversary, or just want to treat my family to something nice. They make you feel welcome and the service is always spot on. The food was good, but the steak had some gristle in it. The server was not as attentive as last time. Very enjoyable experience for the most part. Too dark for elders to be able to read menu or see food. Here's hoping everyone from the wait staff to the kitchen staff was having an off night. We dine here about 8-10 times a year, but this experience was our first disappointing visit. Server was not very attentive. We sat with empty wine glasses for 15 minutes. Our food was good, but not nearly as good as it has always been over the years. We'll certainly go back in the hopes that we were all just off that evening. Great place to have an event! Food,service great. Lamb is best in city. Good food, great value, authentic. Decor is a little dated, but cozy. We had a large group and our server did a terrific job of keeping up with everyone's needs. The happy hour dinner specials are a great value. All of the people were happy with their dinners and most took home the leftovers. Waiter was excellent and the food is always great. Love the food and service. Excellent experience, we were seated right away as we had a reservation. Service was prompt and food was delicious. We like to eat at Spiro’s restaurant after attending Winter Opera at Chaminade and really enjoy their excellent menu and fine service! There’s always a good number of people who must feel the same! Wonderful dinner, quiet , able to visit with friends, and an enjoyable experience. 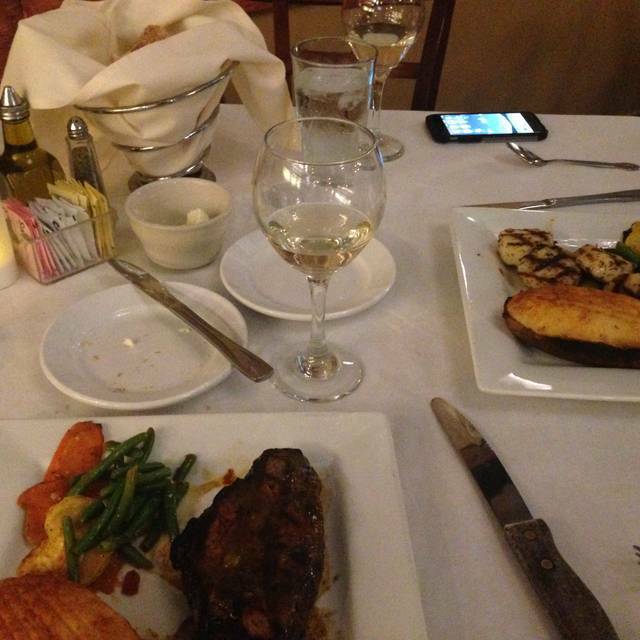 Spiro's is one of our favorite restaurants in St. Louis! We always have a great meal there. The warm sampler appetizer platter is fantastic! We had reservations at 6:15 and arrived 30 min early. I had requested a nice round table as we were celebrating and this was our 10th year doing so. We were seated in the bar area and I was not happy about that. At that point I requested a table in the restaurant because we felt a draft from the front door and did not want to be in the bar area. We originally were a party of 6 and 2 of our friends we'd been waiting for had an emergency so they couldn't come. We let our server know and we could tell he was displeased. From there on out we felt rushed, our courses were on top of each other and the food was not what we've come to expect. We had NO table side service and all of our steaks were cold and over cooked. My husband also heard the staff talking about our table when I was in the bathroom when we were getting ready to leave. Sadly, I don't think we will return. Consistently great!!! The food is always so delicious and the atmosphere and staff are beyond wonderful. We went early with my toddler grandson (not a great idea) and everyone was so sweet and empathetic, which we really appreciate!!! Thank you Spiros! Spiros has been our go to restaurant for years and never disappoints. Good food and service. Delicious food, lovely an ambiance and great value! I would recommend for a special occasion as well as for an evening out with friends. Good food and good service have made this my favorite restaurant. Wonderful service, amazing food, great atmosphere. What else could you ask for!!! Consistency and Quality and Value. The filet was cooked perfect as it was the last time I was at Spiro's. My wife's Greek Salad was amazing. Our waiter was there when needed and made sure that all of my food alergy restrictions were taken care of. I highly recommend this restaurant. We went to Spiro’s in Chesterfield because it looked cozy and because we wanted to try their food... and it was quite comfortable, food was very good and it wasn’t noisy, which we loved since we really wanted to be able to visit without “shouting!” We stayed long past our meal because the couple who play and sing there (Morgantown Duo) were outstanding! We loved their song selections, their harmony, their great voices and excellent instrumentation. But the best part was that we were able to totally enjoy their music while at the same time, still be able to visit with each other. The sound level was perfect for enjoying both! We’ll be back! WITH MORE FRIENDS!! The food was good and the services was great. The only strange thing was the lights above our table flickered for about half of the meal and were distracting.